When I left Rogers Centre after the second game of the season, I was in the best mood I had been in since I left the Stadium after Game 5 of the ALCS. The Yankees had started the season with back-to-back wins, the pitching was dominant and everyone in the offense was contributing (even Tyler Wade). It wasn’t until I returned home that everything started to unravel. In Game 3 of the 2018 season, Tyler Austin showed that everyone in the lineup could produce, and in games when the top of the order wasn’t producing, others would step up. But Aaron Boone ran into his first real test as Yankees manager and failed miserably. Tied 2-2 in the bottom of the sixth, Boone took the ball from CC Sabathia and gave it to Adam Warren to start the inning. Aside from Jonathan Holder and Chasen Shreve, Warren is the Yankees’ third-least trustworthy option. A groundout, a walk and a groundout later with the go-ahead run on second, Warren had somewhat done his job, and after just seven pitches, Boone called on the Yankees’ least trustworthy bullpen option: Jonathan Holder. Sure enough, Holder immediately gave up a single to Luke Maile and the Yankees now trailed 3-2. Austin hit his second home run of the game in the seventh to tie the game once again and Boone brought in Dellin Betances to keep the game tied in the bottom half of the inning. Betances gave up a leadoff single to Curtis Granderson (ex-Yankee comes through in a big spot against the Yankees) before striking out Josh Donaldson on three pitches. With Justin Smoak up, Granderson got the biggest lead of all time and took off for second and it took possibly the best throw down to second in Major League history from Gary Sanchez to throw out Granderson for the second out. Smoak ended the inning with a groundout. The Yankees didn’t score in the eighth, so with the game still tied what would Boone do for the bottom of the inning? He could go to Chasen Shreve, the least trustworthy bullpen option remaining, who hadn’t pitched in a game yet. He could go to Chad Green, who didn’t pitch the day before, but did throw 26 pitches on Opening Day. He could go to David Robertson, who threw just five pitches the day before in his first appearance of the season. I’m assuming he didn’t want to go to Aroldis Chapman at all because he had pitched in the first two games of the series, throwing 33 pitches. Boone decided to go with Dellin Betances for a second inning. Knowing everything we know about Betances since he emerged as an elite reliever in 2014, it’s incredibly risky to ask him to pitch a second inning. On top of that, given the way his 2017 season ended and how he pitched on Opening Day, you would think the Yankees would want him to gain some confidence moving forward. His performance in the seventh inning was a confidence builder. After falling behind Yangervis Solarte (ex-Yankee alert) 2-0, Solarte, clearly sitting on a fastball got one and didn’t miss it. He crushed it to center field for a go-ahead home run. Betances bounced back to strike out Randal Grichuk and then Kevin Pillar singled. And then Pillar stole second. And then Pillar stole third. And then Pillar stole home. It was a disastrous and embarrassing inning for the most pivotal member of the bullpen and absolutely crushing after his previous inning. Around the single and three steals, he allowed a walk, but did strike out the side. But if his confidence hadn’t hit an all-time low near the end of last season, it certainly had now. The Yankees lost 5-3. The next day, the Yankees had built a 4-1 lead heading to the bottom of the seventh, so with nine outs to go and this bullpen, I figured it was safe to sit down for Easter dinner with my family. It wasn’t. Green had pitched a scoreless sixth and Boone called on Tommy Kahnle for the seventh. No problem there. Kahnle walked Donaldson to start the inning and then gave up a two-run home run to Justin Smoak. The Yankees’ lead was now 4-3. Kahnle retired Solarte and Granderson, and with two outs and no one on, Boone called on Robertson. He retired Grichuk on two pitches. In the bottom of the eighth, the Yankees’ lead was 4-3 and Robertson was still on the mound. Russell Martin singled on the first pitch of the inning and then Pillar lined out to center on the seventh pitch of his at-bat for the first out of the inning. Aledmys Diaz doubled to center to move Martin to third, but Devon Travis jumped on the first pitch he saw and grounded it right back to Robertson for the second out. The Blue Jays had second and third with two outs, and Robertson was one out away from holding the lead. Robertson got behind 2-0 and then got even at 2-2. The fifth pitch of the at-bat was fouled away and the sixth pitch was a ball to move the count full. The seventh and eighth pitches of the at-bat were fouled away. The ninth pitch? The ninth pitch was destroyed to left-center for a go-ahead grand slam. The feeling leaving Rogers Centre after the second game of the season had been erased. Back-to-back bullpen meltdowns had put the Yankees back at .500, and with the way the Easter game unfolded, I thought, That is the low point of the season. Well, I wanted it to be. If the low point were to come in Game 4, at least I knew that the next 158 games wouldn’t crush me the way that one had. A week later in Game 10, after dropping two of first three games to the lowly Orioles, the Yankees scored five runs in the first inning to ensure they wouldn’t lose the four-game series. Unfortunately, Jordan Montgomery was unable to get through five innings and the Orioles slowly came back. The Yankees led 6-4 at the end of the fifth, but in the seventh, Boone stuck again. Domingo German had been called up from Triple-A and he relived Montgomery in the fifth. German threw 11 pitches in the fifth and 24 pitches in the sixth. He allowed one run on two hits with four strikeouts. He had done his job. But Boone wanted him to keep doing his job, so he left him out there for the seventh. The bullpen as a whole might have been tired in Game 10, which was partially Boone’s fault for pulling his starters each game with low pitch counts, a trend that had been backfiring on rookie managers around the league, and partially because of the 14-inning game. But that game had happened Friday night into early Saturday morning, and not every reliever was overextended, and it was now Sunday afternoon. With one on and two outs in the seventh, German had more than done his job, but Boone kept sticking with him, trying to squeeze out with fringe Major Leaguers the way his predecessor Joe Girardi would constantly do. It came as no surprise when Anthony Santander got the green light on 3-0 and hit a two-run home run to give the Orioles a 7-6 lead as they had come all the way back. The Yankees came back in the seventh on a two-out RBI single from none other than Austin Romine. Boone then went to Betances for a scoreless eighth and Chapman for a scoreless ninth. Apparently, Robertson was unavailable because he went to Shreve for the 10th. I was certain Shreve would give up a run if not more, but he pitched a perfect 10th. Then in the 11th, Boone went to Robertson. So Robertson was available. Boone was willing to lose with Shreve on the mound and Robertson in the bullpen, which means Boone would have had to lie in his postgame press conference and say that Robertson was unavailable because he would have never been able to such a decision. It wasn’t until the 12th when Adam Warren came in to ruin the game. With Pedro Alvarez on first and two outs, Warren gave up back-to-back singles to Santander and Craig Gentry and the Orioles had an 8-7 lead. In the bottom of the 12th, Boone let Romine bat for himself, despite Sanchez being on the bench. The only way this is OK is if Sanchez has a broken bone, and if he had a broken bone, he would be on the DL. So if Sanchez is on the bench and not on the DL then he bats for Romine no matter what. Luckily for Boone, Brad Brach was off and walked Romine on five pitches. Brach then walked Didi Gregorius (he had pinch hit for Ronald Torreyes in the seventh) on five pitches. The Yankees had first and second and no one out for the top of their order. Aside from Nick Swisher, the worst sacrifice bunter in recent memory has been Brett Gardner. Bunt for a hit? No problem. Bunt to move runners over? Disaster. Girardi never learned this and Boone likely didn’t know about it, so he had Gardner do just that. After failing (to no surprise) to get the bunt down on the first four pitches of the at-bat, Gardner bunted again with two strikes(!) and laid it down. Brach was unable to come up with it and the Yankees had the bases loaded with no outs for Aaron Judge and Giancarlo Stanton. The Yankees now had a 75 percent change of winning. The Yankees were going to win the game. Two pitches later, Judge grounded the ball right back to Brach who throw home to Caleb Joseph for one out and Joseph threw to first for the second out. A 1-2-3 double play. The Yankees now had second and third with two outs for Stanton and a chance for him to erase the early-season Stadium boos and have his first big Yankee moment. The Yankees were now .500 again at 5-5 and headed to Boston for a three-game series. THAT loss to the Orioles had to be the lowest point of the season. In the series opener against the Red Sox, the game was over before it started. Luis Severino gave up one run in the bottom of the first and needed 27 pitches to get through the inning. That one run seemed insurmountable with Chris Sale on the mound, but to put it out of reach for good, Severino gave up three more in the second. A nine-run sixth inning for the Red Sox made it 14-1 and they would win by that score. Now THAT loss had to be the lowest point of the season. The Yankees routed the Marlins on Monday night because that what good teams and teams with championship aspirations do against bad teams and teams clearly tanking. The Yankees won 12-1 and after beating the Tigers on Friday, they were now 8-7 and maybe ready to go on a run of their own like the Red Sox were. On Tuesday, Masahiro Tanaka quickly gave up three runs in the first to the Marlins. A Gregorius two-run error was part of it, but Tanaka gave up three singles and a walk around the error, and it’s hard to say anything negative about Gregorius at this point of the season. In the bottom of the first, Gardner and Judge both walked and looked like the young left-hander Jarlin Garcia might have a little poop in his pants pitching at Yankee Stadium with eight of his first 11 pitches going for balls and Stanton coming up. Nope. Stanton grounded into a double play to ruin the rally. The Marlins scored again in the fourth to make it 4-0, but even as their lead grew, it felt like the Yankees would come back and win the game. This is a Marlins team whose best player is Starlin Castro. In the bottom of the third, with one out, Gardner and Judge walked again. Here it is. The moment where Stanton would make the wild lefty pay. Stanton got ahead 3-0 and then swung on 3-0, fouling away what would have been ball 4. He popped up to second on the next pitch. Tanaka retired the first two hitters in the fifth, but then a slow-roller to third and a walk brought up J.T. Realmuto and he deposited a three-run home run to right field. The Marlins lead was now 7-0. 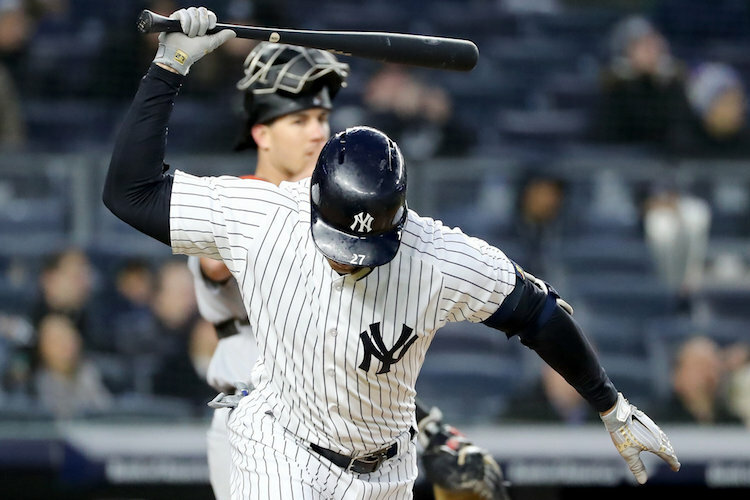 The Yankees had one last chance to get back in the game when they loaded the bases with one out in the sixth, but Neil Walker and Tyler Austin struck out to end the inning. The Yankees lost 9-1 to the Marlins. A Marlins team that traded away Stanton and Marcel Ozuna and Christian Yelich and Dee Gordon in the offseason. A Marlins team that knows their season is only going to be 162 games for the foreseeable future. A Marlins team that is tanking so hard, Major League Baseball might have to do something to prevent such obvious tanking in the future. If Tuesday’s 9-1 loss to the Marlins wasn’t the lowest point of the 2018 season then I don’t want to know what is. The Yankees are 8-8 after 16 games and already trail the Red Sox in the AL East by six games and the season isn’t even three weeks old. The Yankees’ next 21 games are against Blue Jays (4), Twins (4), Angels (3), Astros (3), Indians (3) and Red Sox (3). Thankfully, the lowest point of the season is out of the way and now I know that by May 10, when this 21-game stretch is over, if I will have a baseball season to watch this summer or not.